For those of you wanting to know the "nuts and bolts" of the observatory's equipment - this page is for you. The main instrument is a 17.5" fork mounted equatorial Newtonian reflector driven with ServoCAT GOTO drive designed and engineered by Jay Rasmussen of Kenesaw Nebraska. The Right Ascension gear is a 12" Mathis 266 tooth anodized aluminum gear purchased in the early 80's. The Declination gear was manufactured by www.gototelescopes.com and is a 12" 360 tooth anodized aluminum gear. The mirror was manufactured by the former Coulter Optics and is supported by a Novak 18 pt cell - previously owned by Charles Morris at the JPL in Pasadena California. Now tested by Steve Swayze of Portland Oregon, refigured, and re-coated with enhanced coatings by Spectrum Coatings of Deltona Florida. The spider is custom made by Jay Rasmussen and the secondary mirror holder was created by Kenneth Novak - deceased. The focuser is a Jim's Mobile EV-1nM 2" Crayford with motorized focus. Finders include a University Optics (no longer in business) 11x80 mm with right angle amici prism or straight through option and a Telrad manufactured by my friend, now deceased, Steve Kufeldt in Southern California. 10,000 step digital encoder setting circles are employed along with SkyCommander database. Eyepieces include, among others, 4 Televue Naglers 20mm type 2, 13 mm, 9 mm, and 7 mm. Light pollution rejection filters include Lumicon Deep Sky and Ultra High Contrast - in 2" and 1.25" sizes and an OIII filter in 2" size. 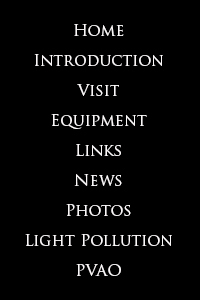 For photography I have an Orion StarShoot AutoGuider I attach to the 11 x 80 finder. Imaging is done by a Canon EOS T3i with Gary Honis modified Baader UV/IR cutoff filter and camera control with EOS Backyard. In addition to the large scope I also have a vintage 1972 Optical Craftsman 6" f10 (Sirius Model) German Equatorial Reflector with added clock drive and circles, a set of 10x70 Fujinon binoculars on a parallelogram suspension mount, and a 10" Meade (link shows a newer model)dobsonian mounted reflector. The observatory has Thousand Oaks Optical filters for solar photography with a 500 mm lens and viewing through a 80mm Swarovski spotting scope (newer version linked) equipped with Baader Solar Film. 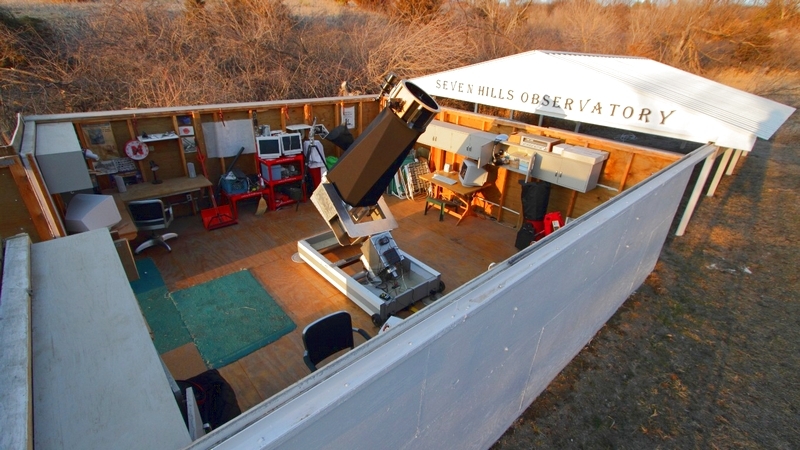 The observatory now has a Sky Quality Meter and will be reporting sky darkness to Loss of the Night and Globe at Night.